AllAboutDogFood.co.uk is intended to be a one-stop-shop for anyone interested in their dog's diet. It is fully independent. It includes the world’s first interactive dog food and dog treat directories as well as the first dynamic dog food comparison page. Our comprehensive feeding guide, dog food FAQ and dedicated dog food forum also give dog owners access to a huge amount of impartial nutritional advice. Most importantly, AllAboutDogFood.co.uk is fully independent and all of its tools and info are available completely free of charge. 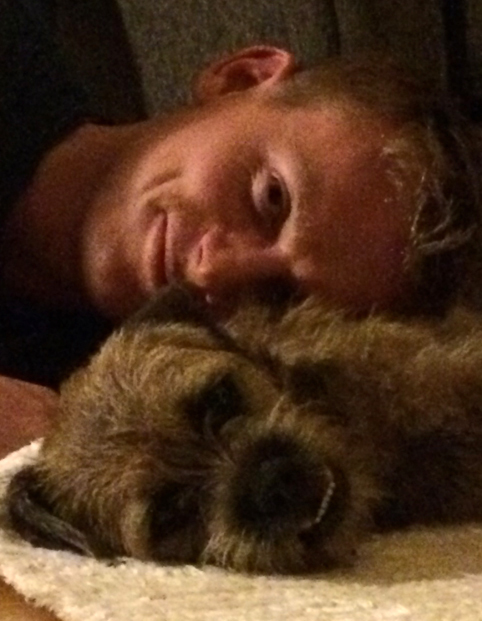 My name is David Jackson and I am the creator, designer, developer and researcher of AllAboutDogFood.co.uk, not to mention the proud owner of Ned, my gorgeous border terrier. My background in brief: I graduated with a zoology degree back in 2002 and was taken on as a nutritionist by Burns Pet Nutrition in South Wales. I was trained in-house to help pet owners to deal with health problems through diet, formulate pet food recipes, quality control and so on. In 2008 I became the head nutritionist at The Natural Dog Food Company in Lincolnshire where I worked until 2011. Over that time I was able to work with a whole host of amazing pet experts from vets and behaviourists to groomers and breeders to help thousands of pet owners to make the right dietary choices for their four-legged friends. Crucially, I was also able to engage in all sorts of secondary roles within the industry - roles like marketing and sales that opened my eyes to the intricate connectivity between product formulation, pet health and company profits. Work started on the site in 2011. From day one I was determined that the site would be 100% independent and transparent so I immediately severed all working ties with pet food manufacturers and ceased all forms of paid consultation. The first version, called WhichDogFood.co.uk, went live on March 10th 2012 and, it has to be said, went virtually unnoticed, at least for the first few months. With no advertising budget, it took what seemed like an age for word to start to spread but once it did, there was no looking back! For the first couple of years, every spare hour went into expanding the database and developing the site and after a while, when it became clear that it was going to be much more than a simple product finder, the name WhichDogFood just didn't seem to cut it anymore. I have always been all about dog food so picking the new name wasn't difficult. Now in 2018, AADF is the UK's number one pet feeding advice site. Over 70,000 people from over 130 countries worldwide visit the site every month and, with your support, that number is growing all of the time. Of course, with over 8 million dogs in the UK alone, we still have a very, very long way to go so please keep spreading the word and if you have any suggestions for the site or if you spot any inaccuracies at all, please be sure to let me know. The big question - how are we funded? Briefcases of cash changing hands on park benches? Sadly not. Although the site's revenue is slowly increasing, it still doesn't make nearly enough to warrant the hours put in. Nevertheless, of the money that does come in, the lion's share comes from the 'buy online' links you can find on most of our food and treat review pages. As well as generating a little cash, these buttons help to smooth the user experience by taking customers directly to the relevant products on trusted web stores. We always try to give the manufacturers themselves first refusal as they should be the most reputable source for any food but when they are not interested, we then try to look for a dependable, ethical online retailer to direct customers to instead. To ensure fairness, we charge the same flat (and very small) monthly fee for all buy-online buttons, no matter what rating the product is awarded or how many clicks the button gets. The adverts, like the one on the right of this page, also bring in a little money. The only other source of income is the store finder where retailers can opt to pay for a premium listing rather than stick with the basic free option. We don't charge for listing products and we never accept any other forms of payment, donations or gifts from vested interests. Fortunately, by doing everything myself, and I do mean everything, the site's costs are very low but if it was just about the money, AADF would have been shut down a long time ago. I do, of course, have ambitions that the site will one day make a good living but in the mean time, as crazy as it may sound (even to myself), I am happy just to make a difference. For far too long, pet food manufacturers have been able to get away with producing, frankly, awful foods for our pets. Somebody once said "don't blame the player, blame the game" and never has that been more appropriate. The game here is corporate capitalism and there is only one rule - make as much money as possible. The companies best able to cut costs while maximising income reign supreme and while that might work in other industries, it is not good news for our pets. The combination of low grade ingredients and elevated prices has been such a recipe for success for the 'the big 3' pet food corporations that most consumers aren't even aware that alternatives exist. And what's worse, the health problems that are often linked to low grade foods are now so widespread that many pet owners just disregard them as a normal part of a dog's life. So many dogs are living short, problem-filled lives and nobody's blinking an eye. As with any game, the key is understanding the rules. Making as much money as possible depends on selling products which makes the consumer, that's you and me, king! By unveiling the enormous variety of foods out there and by letting people know what makes one food different from another and what effects those differences might have on their dogs, dog owners will, for the first time, be able to choose what's right for their dog instead of what's right for corporate profits. And as more and more people change to better foods, the entire industry will have to move to catch up and before we know it, our dogs will be as healthy and as happy as they deserve to be! I have always been an optimist. If you have any questions, comments or criticisms, or if you would like to contribute to AllAboutDogFood.co.uk in any way, please get in touch here.